This trip was mainly about getting some unfinished business done in the Oregon Cascades. During our trip to Mt Washington and South Sister last week, I had been looking longingly at the jagged rocky crest of Three Fingered Jack. But I couldn't convince David or Sky to ski it this late in the season, especially since the easily-visible south and west sides looked to be melting out fast. Nevertheless, I held out hope that the Northeast Cirque of TFJ would still deliver the goods, and the approach there from Jack Lake (5150 ft) is much shorter than the standard approach up the PCT from Santiam Pass. I didn't really expect much from this trip, but it turned out to be quite pleasant and also very scenic. I left Seattle around 9 am Monday and managed to reach the trailhead at Jack Lake by 3 pm, with temps in the mid-80s. Seemed like perfect weather for an evening ski run on north or northeast slopes. The good 2-mile trail to Canyon Creek Meadows was 99% snowfree, yet as soon as I dropped over the ridge into the meadows at 5500 ft the snow became nearly continuous. I headed southwest following remnants of boot tracks up the main drainage leading to the toe of the Jack Glacier at 6000 ft. This small glacier is not shown on USGS topo maps, but it does have some active glacial features such as bergschrunds, and its presence makes TFJ the lowest glaciated peak in Oregon (and the lowest in the US outside WA or AK). I skirted the east edge of the glacier and moraines, then headed left (SE) to the highest nearby snow at the summit of Point 6855 on the East Ridge of TFJ. This ridge has a spectacular vista of Mt Washington and Three Sisters / Broken Top to the south, while the cone of Mt Jefferson dominates the view to the north. The cirque itself is very scenic too, with the dark rocky precipices of TFJ looming directly over the glacier and a small very blue meltwater lake. The ski down at 5:45 pm was nice, with decent corn up high and heavier stuff below 6000 ft. The upper portion would have been worth yo-yoing a second or third time, but it was getting late. There were numerous other ski tracks up there, but none looked less than a few days old. In total about 1250 vft was continuously skiable back down to the meadows. A quick hike brought me back out to Jack Lake and the car by 7 pm. Three Fingered Jack thus became the 26th Cascade volcano on which I'd skied at least one route. This photo looks north over the cirque from about 6500 ft, with the Jack Glacier and its blue lake at lower left and Mt Jefferson crowning the horizon. Amar, thank you very much for this post! 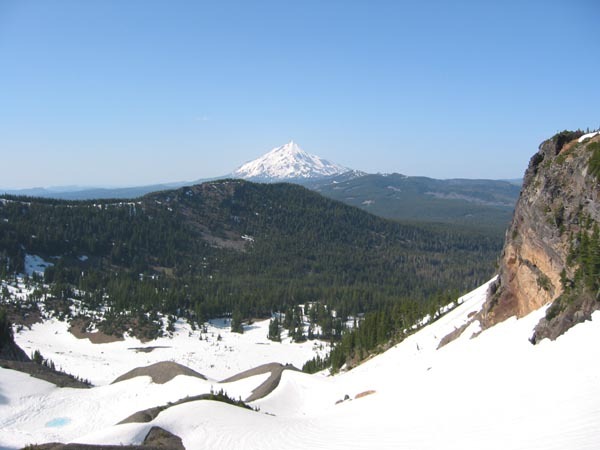 I have wondered if I could ever muster the 5 mile hike into TFJ via the PCT for a relatively short ski here...(One of my personal goals is to ski on all the major cascade volcanoes also).... This TH gives me hope!!! (Call me lazy) I thank you again, for you have re-kindeled my desire for TFJ.